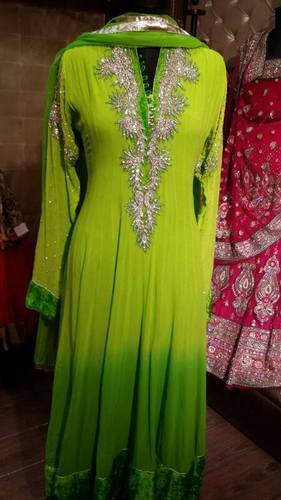 We have exclusive showroom for our clients, a wide array of Anarkali Suits, which are very much in fashion these days. 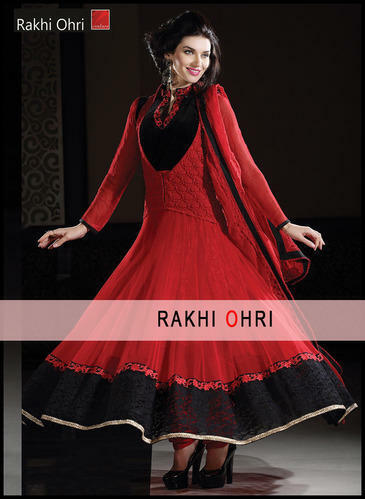 Anarkali suits are unique because of its unique feature and superior quality fabrics. Available in a variety of fabrics, designs, styles, cuts and colors, our anarkali suits are in great demand world over. 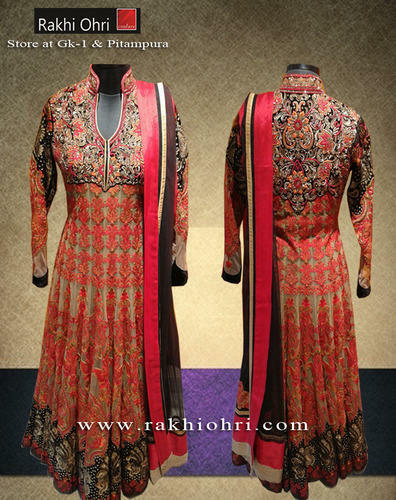 These reflect the true beauty of the fabric used, which is adorned by embroideries & rich work. Whatever is your need of Designer anarkali suit we design specialized suits in the fabrics of your choice so that you are always the trend setter whether at office or at home. We offer stylized westernized salwar suits with exotic material or netted cloth that give that ethereal as well as functional clothes. 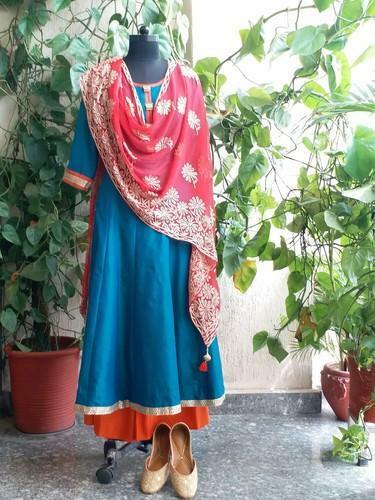 Chanderi cotton anarkali suit with A-line plazzo and chiffon embroidered dupatta. 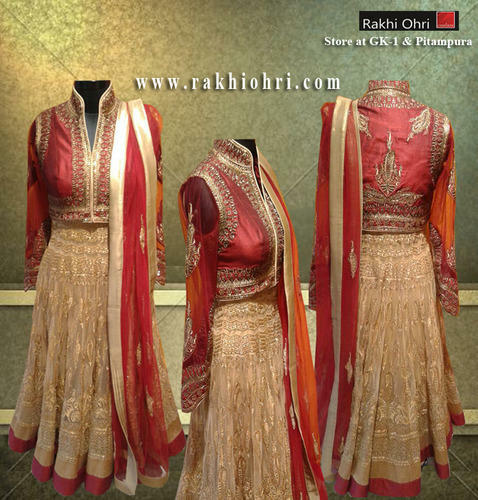 We also offer exquisitely designed Anarkali suits as part of wedding trousseau in colors and designs that bring out the best in the bride between one ceremony after the other. In lovely pastels with just the hint of red our dresses have the touch of class as well as comfort for our brides. 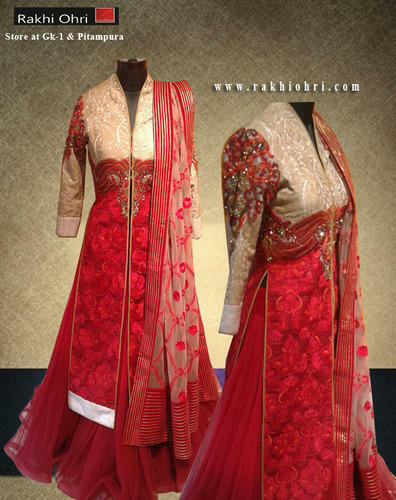 We also offer exquisitely designed salwar suits as part of wedding trousseau in colors and designs that bring out the best in the bride between one ceremony after the other. In lovely pastels with just the hint of silver our dresses have the touch of class as well as comfort for our brides. 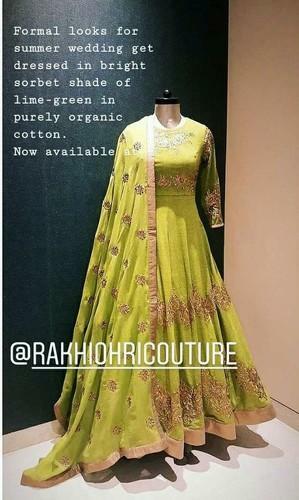 We have exclusive Collection showroom for our clients, a wide array of Anarkali Suits, which are very much in fashion these days. Anarkali suits are unique because of its unique feature and superior quality fabrics. Available in a variety of fabrics, designs, styles, cuts and colors, our anarkali suits are in great demand world over. 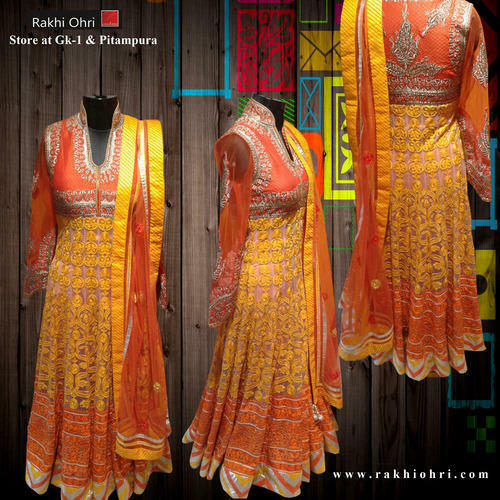 These reflect the true beauty of the fabric used, which is adorned by embroideries & rich work. 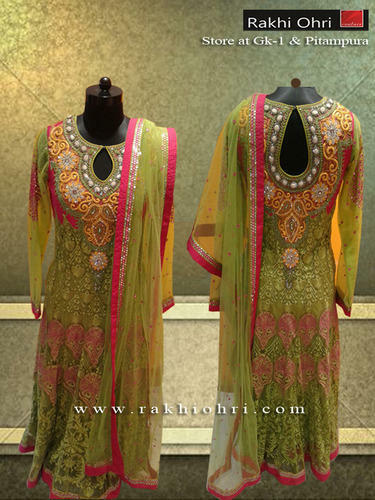 Floor length kalidaar designer suit with zari embroidery with embroidered dupatta. 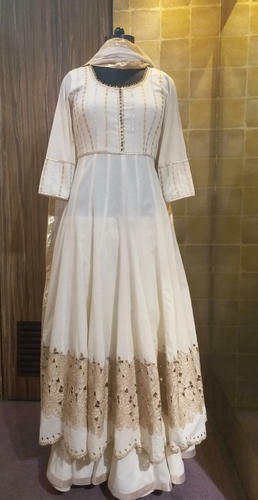 Cotton anarkali suit featuring scalloped hemline and cut work embroidery with kalidar sharara and dupatta with foil edging. 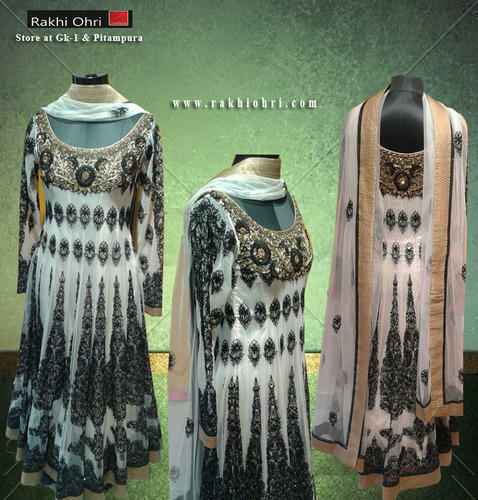 cotton anarkali suit with cotton wrinkled gharara and mirror work dupatta. Avail from us a stylish range that is also in sync with the latest fashion trends. 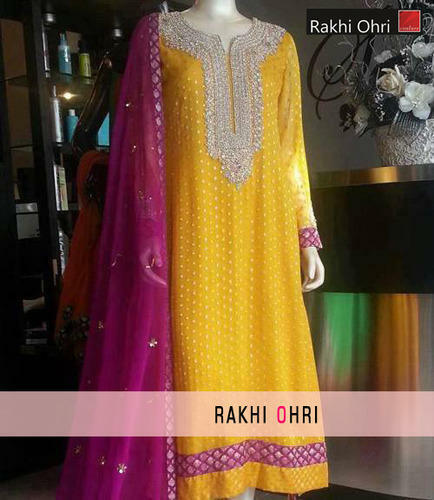 These suits are available in various exclusive colors and designs and helps in enhancing the beauty of wearer. The range come in various cuts and finishes, in different sleeve styles such as half, three forth and also full sleeves. The range of suits are also combined with different types of salwars like churidar, patiala and plain to complement the stylish suits in various innovative necklines. Cotton chanderi jacket style anarkali suit with A-line plazzo. 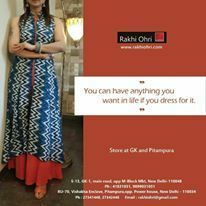 We are a very focused group of designer salwar suits and are committed to delivering niche women’s wear that will suit not only the style and design but in budgets as well. Our salwar suits are made in a variety of colors and fabrics to suit the varying climatic conditions in the country.